Bridge Road’s Brew Water – it’s more like water than Budweiser is. I’m pretty sure some people bought a bottle of this from Bridge Road Brewers and thought ‘‘ha, they made a beer and called it Brew Water. What irony.’’. Umm, nope. No irony here. Or beer – what’s inside that bottle actually is brew water. Which, I will admit, made pouring it into a glass seem a bit surreal. Even when you know it just water, tipping a brown beer bottle over and seeing a clear liquid pour out is just strange. 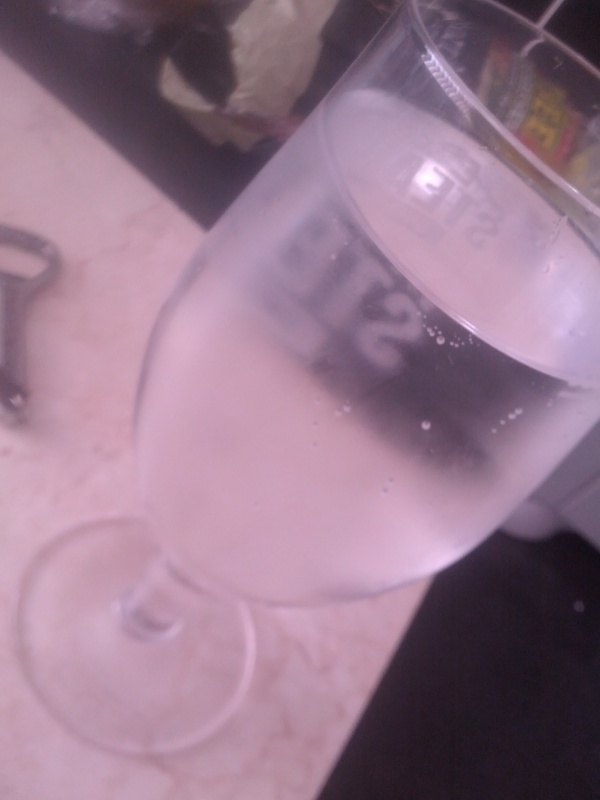 For the hell of it, here’s a shot of Brew Water in the glass. As you can see, it pours very clear and there’s no hop aroma to speak of. Ha! See what I did there? Anyway, it should be said that it isn’t just tap water in the bottle. It’s genuine treated water that Bridge Road use to brew with. As the label says ‘‘At Bridge Road Brewers, we adjust our water mineral content to suit each style of beer by adding certain salts’’. 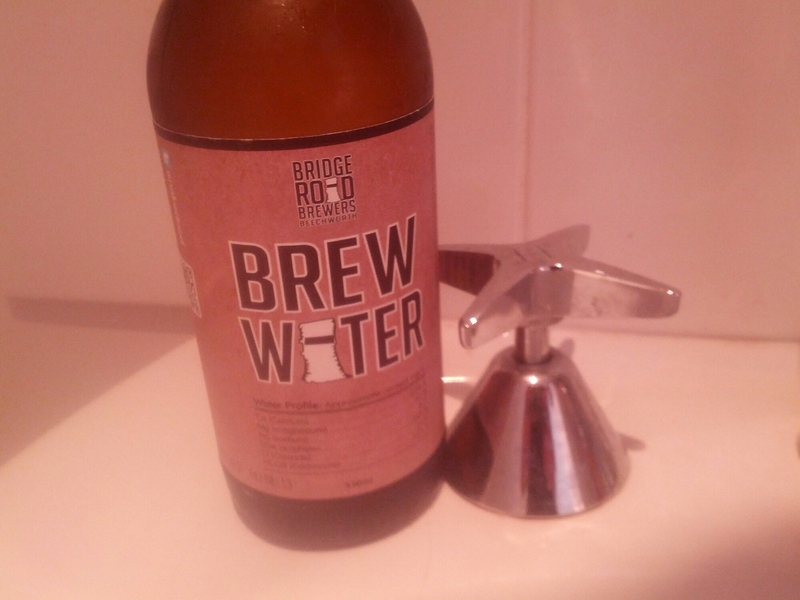 In this case, Brew Water is the water Bridge Road use to make their Bling IPA and the flagship Beechworth pale ale. The flavour is distinctly minerally and I could detect some of the effervescence I’d noticed before in Beechworth (at least that’s how my mouth interpreted it. What I found seemed distinct from what might be created by carbonation). By tasting the water after drinking quite a few Beechworths in my time, it allowed my brain to see just where the water slots into the beer’s overall flavour profile and discover what it brings to the beer. For me, it was an educational experience akin to the single hop IPAs Bridge Road (and others) brew. Those beers allow people to sample a single hop in isolation, to better understand what it brings to the party. Doing the same with water is a lesser-known approach – I’ve not heard of anyone anywhere in the world doing this. What I’d really like to Ben Kraus from Bridge Road do is release a Brew Water six-pack, where he includes three of his beers along with three bottles of the brew water used to make them. That way, you could sample the water and then the beer and see how it all works. I know I’d buy a six-pack like that. And I bet loads of other beer geeks would too. And only partially because it would allow them to “legally” check in water on Untappd. I wouldn’t mind seeing this in a blind line up. This is one of those is it genius or over marketing selling water to people in a beer bottle so they think its a different kind of beer. Irony and stupidity in one I think.